UNITED NATIONS, January 2, updated -- The UN speaks but does not follow through. Just around the New Year's weekend, Secretary General Ban Ki-moon issued statements about averting violence in South Sudan, avoiding reprisal killings in Guinea Bissau, as well as inflating his role in the Arab Awakening. "a statement published by Yemen's official news agency over the weekend, Mr Saleh said he would 'not allow the collapse of state institutions,' in response to an increased number of protests within government institutions designed to unseat Saleh loyalists that continue to hold key positions. 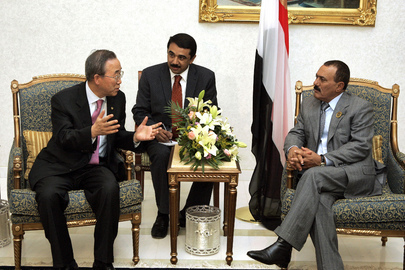 Meanwhile, Yemeni officials said Mr Saleh cancelled a planned trip to the United States after a request by party members." Similarly, no explanation was offered when requested for the UN's failure to reach even all parts of Pibor town in South Sudan, where the UN has a peacekeeping mission. Of the "scores" left dead, "Murle MPs blame SPLA, UN for Pibor attacks" -- again, no response or explanation as "South Sudanese MPs from the Murle community have blamed the army and UN peacekeepers for allowing armed men from the Luo-Nuer ethnic group to attack Pibor town on Saturday." While Ban has stopped speaking much about Haiti, since his Office received a claim for reparations for introducing cholera, no response was given to a new series of protests over the weekend at the UN base in Mirebalais demanding the withdrawal of the MINUSTAH mission. Holidays took the day. Ban and Saleh: who will stay in office longer? Ban's call to avoid reprisals in Guinea Bissau, where the UN had already sheltered the coup leaders / drug kingpin, fell on deaf ears, with at least one lower lower coup participant subject to extrajudicial killing, Major Yaya Dabo: "as he arrived at the police station to turn himself in, agents on duty encircled his vehicle, he was shot at and killed." But there was no response from the UN. This bodes badly for second term of Ban. Watch this site. Update: Nine hours after the questions were posed, and after publication of the above, the UN put out a statement on one of these four issues: South Sudan. It did not respond to the Muerle MPs blaming the UN and South Sudan authorities "for allowing armed men from the Luo-Nuer ethnic group to attack Pibor town." Rather, it was a read out of Ban Ki-moon speaking WITH the South Sudanese president. Watch this site.